Madland is pictured second from right. John Madland won the 2018 Lemelson Award for Invention by building a model showing that a magnetic shield set above the surface of Mars may protect people on the planet’s surface. When asked about the importance of his project, John replied, “If I can help those first pioneers be a little safer on Mars, that would be a huge contribution,” said Madland. Beginning in 2019, The Lemelson Foundation will increase its award from $7,500 to $10,000 and provide additional support to the Society for Science & the Public. 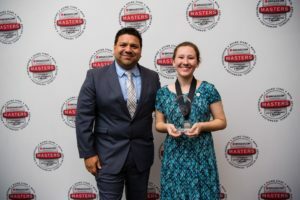 The Broadcom MASTERS top awards will now include the $25,000 Samueli Foundation Prize, the $10,000 Marconi/Samueli Award for Innovation and the $10,000 Lemelson Award for Invention. Other prizes include top awards in math, sponsored by Robert John Floe, President, Floe Financial Partners and a semifinalist prize for the Top 300 finalists from Jeff Glassman. The news was announced on National Inventor’s Day with the Society for Science & the Public. Read more details here.